Meet Ricky, the owner of this insane Mazda RX-7 FD with over 485whp. 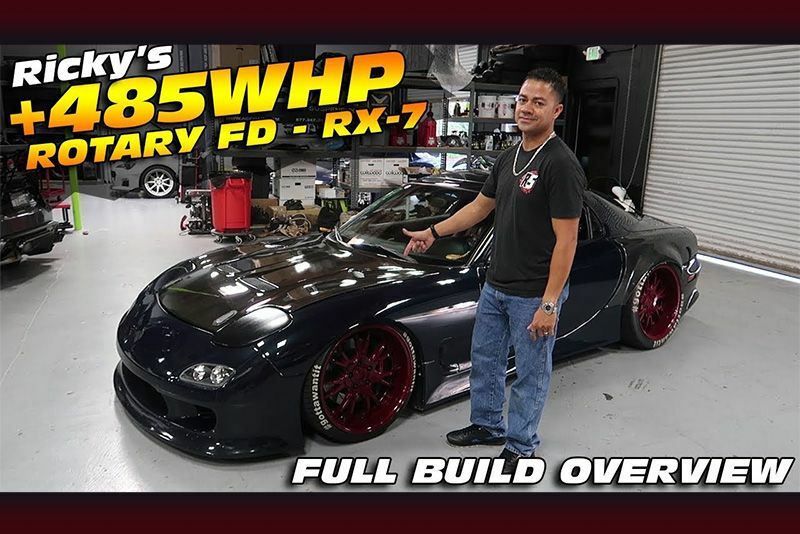 Ricky visits the boys at throtl on YouTube with his heavily modified Mazda RX-7 FD and gives us a rundown of all the work he's done on it. As you most likely have figured out by now, many of the SXdrv staffers are big rotary fans, and cars like this one are, basically, like cupcakes to kids. There's so much to look at and learn about on this 485whp beast, for instance, the reworked radiator and air intakes, revised piping and a bunch of other stuff including air suspension and engine mapping. The interior has received updates to, including racing seats attached to a harness bar and Takata harness seatbelts, a trio of gauges, a short-shift gear lever and various other mods too. On the outside, the RX-7 sports a full Vertex body kit with carbon fibre rear fenders giving it a wide-body look and help cover the wheels, Worx GS4 19x10" rims up front and 19x11 at the back, while big custom brakes help it come to a stop. The rotary throws out such large flames that the exhaust pipe needed a five-inch extension to stop it from melting the rear bumper. Nice! For more about this cool 485whp, Mazda RX-7 hit the play button below and enjoy the show.